Urang dipaké pikeun ngimpi ngeunaan hal ieu. Kiwari, urang bisa ngabangunna. Ieu cukup rapih. 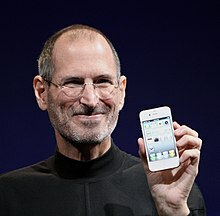 Steven Paul Jobs (24 Pébruari 1955 – 5 Oktober 2011) nyaéta pupuhu sakaligus CEO di Apple Inc., hiji parusahaan nu diadegkeun ku anjeunna jeung Steve Wozniak dina taun 1976. Anjeunna ogé CEO di Pixar Animation Studios nikakeun diakuisisina ku Walt Disney Company dina taun 2006. 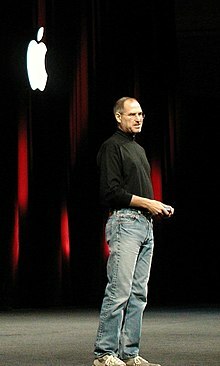 Steve Jobs téh nu nyekel saham pribadi pangbadagna di Walt Disney Company ogé mantan anggota Déwan Diréksi. Anjeunna dianggap minangka inohong pangpunjulna dina dunya komputer jeung industri hiburan. Kami ngajudi kana visi kami, jeung kami leuwih resep ngalakonanna tinimbang nyieun produk "urang ogé"
Resepan kénéh jadi bajak laut daripada ngahiji jeung Angkatan Laut. Kuring bakal dagangkeun sakabéh téknologi kuring pikeun burit jeung Socrates. Nya George Orwell téh bener kitu ngeunaan 1984? Memory and Imagination: New Pathways to the Library of Congress (1991); this has sometimes been paraphrased "Computers are like a bicycle for our minds." Being the richest man in the cemetery doesn't matter to me … Going to bed at night saying we've done something wonderful... that's what matters to me. I'm convinced that about half of what separates the successful entrepreneurs from the non-successful ones is pure perseverance. It is so hard. You put so much of your life into this thing. There are such rough moments in time that I think most people give up. I don't blame them. Its really tough and it consumes your life. 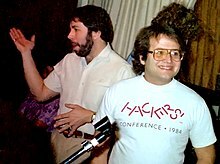 If you've got a family and you're in the early days of a company, I can't imagine how one could do it. I'm sure its been done but its rough. Its pretty much an eighteen hour day job, seven days a week for awhile. Unless you have a lot of passion about this, you're not going to survive. You're going to give it up. So you've got to have an idea, or a problem or a wrong that you want to right that you're passionate about otherwise you're not going to have the perseverance to stick it through. I think that's half the battle right there. As quoted in Newsweek (29 October 2001), "The Classroom Of The Future"
People think it's this veneer — that the designers are handed this box and told, 'Make it look good!' That's not what we think design is. It's not just what it looks like and feels like. Design is how it works. We don't believe it's possible to protect digital content … What's new is this amazingly efficient distribution system for stolen property called the Internet — and no one's gonna shut down the Internet. And it only takes one stolen copy to be on the Internet. And the way we expressed it to them is: Pick one lock — open every door. It only takes one person to pick a lock. Worst case: Somebody just takes the analog outputs of their CD player and rerecords it — puts it on the Internet. You'll never stop that. So what you have to do is compete with it. Every once in a while a revolutionary product comes along that changes everything. It's very fortunate if you can work on just one of these in your career. … Apple's been very fortunate in that it's introduced a few of these. I make 50 cents for showing up … and the other 50 cents is based on my performance. Variant: I wish developing great products was as easy as writing a check … if so, then Microsoft would have great products. 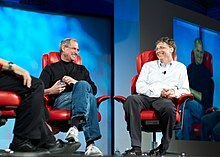 On how Apple is the largest developer for Microsoft Windows due to the popularity of its iTunes software, at the All Things Digital Conference 5 (30 May 2007), on stage with Bill Gates, Kara Swisher and Walter Mossberg. Here's to the crazy ones. The misfits. The rebels. The troublemakers. the round pegs in the square holes. The ones who see things differently. The're not fond of rules. And thay have no respect for the status quo. You can quote them, disagree with them, glorify or vilify them. But the only thing you can't do is ignore them. Because they change things. They push the human race forward. While some may see them as the crasy ones, we see genius. Because the people who are crazy enough to think thay can change the world are the ones who do. Apple Inc. "Think different" advertizing company. The only way to do great work is to love what you do. If you haven't found it yet, keep looking. Don't settle. As with all matters of the heart, you'll know when you find it. And, like any great relationship, it just gets better and better as the years roll on. So keep looking. Don’t settle. Sometimes life hits you in the head with a brick. Don’t lose faith. I’m convinced that the only thing that kept me going was that I loved what I did. You’ve got to find what you love. And that is as true for your work as it is for your lovers. Your work is going to fill a large part of your life, and the only way to be truly satisfied is to do what you believe is great work. And the only way to do great work is to love what you do. If you haven't found it yet, keep looking. Don't settle. As with all matters of the heart, you'll know when you find it. And, like any great relationship, it just gets better and better as the years roll on. So keep looking. Don’t settle. When I was young, there was an amazing publication called The Whole Earth Catalog, which was one of the bibles of my generation. It was created by a fellow named Stewart Brand not far from here in Menlo Park, and he brought it to life with his poetic touch. This was in the late 1960's, before personal computers and desktop publishing, so it was all made with typewriters, scissors, and Polaroid cameras. It was sort of like Google in paperback form, 35 years before Google came along: it was idealistic, and overflowing with neat tools and great notions. Stewart and his team put out several issues of The Whole Earth Catalog, and then when it had run its course, they put out a final issue. It was the mid-1970s, and I was your age. On the back cover of their final issue was a photograph of an early morning country road, the kind you might find yourself hitchhiking on if you were so adventurous. Beneath it were the words: “Stay Hungry. Stay Foolish.” It was their farewell message as they signed off. Stay Hungry. Stay Foolish. And I have always wished that for myself. And now, as you graduate to begin anew, I wish that for you. Stay Hungry. Stay Foolish. Sometimes I believe in God, sometimes I don’t. I think it’s 50-50 maybe. But ever since I’ve had cancer, I’ve been thinking about it more. And I find myself believing a bit more. I kind of – maybe it’s ’cause I want to believe in an afterlife. That when you die, it doesn’t just all disappear. The wisdom you’ve accumulated. Somehow it lives on, but sometimes I think it’s just like an on-off switch. Click and you’re gone. And that’s why I don’t like putting on-off switches on Apple devices. "If you want it, you can fly, you just have to trust you a lot". "If it could save a person’s life, could you find a way to save ten seconds off the boot time? 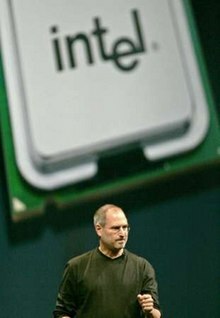 If there were five million people using the Mac, and it took ten seconds extra to turn it on every day, that added up to three hundred million or so hours per year people would save, which was the equivalent of at least one hundred lifetimes saved per year. Last words (5 October 2011), as reported by his sister Mona Simpson in her eulogy for her brother on 16 October 2011, at his memorial service at the Memorial Church of Stanford University; presented in the New York Times (30 October 2011) (The words were capitalized in the text.) According to Ms. Simpson, these words were spoken hours before his death, and after "he’d looked at his sister Patty, then for a long time at his children, then at his life’s partner, Laurene, and then over their shoulders past them." This favorite phrase of Jobs is from the final edition of the Whole Earth Catalog, entitled Whole Earth Epilog (1974), as he acknowledged in his 2005 Stanford Commencement Address. This is a favorite phrase of Jobs, but he is (mis)quoting Pablo Picasso. "Lesser artists borrow; great artists steal" is similarly attributed to Igor Stravinsky, but both sayings may well originate in T. S. Eliot's dictum: "Immature poets imitate; mature poets steal; bad poets deface what they take, and good poets make it into something better, or at least something different. The good poet welds his theft into a whole of feeling which is unique, utterly different than that from which it is torn." Kaca ieu panungtungan diédit 31 Juli 2015, jam 05.50.